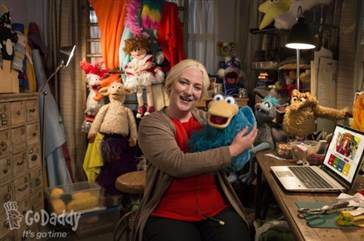 Quitting your Job, Puppets and the Super Bowl! | don't bite the apple…work is not a fairy tale! Quitting your Job, Puppets and the Super Bowl! Super Bowl Sunday is over! We were treated to a moving opening, a fantastic halftime show, and a blowout of a game. With a score that was so one-sided, however, people had to turn to the commercials for excitement. Unfortunately, between YouTube and endless coverage, the commercials weren’t really “new”, but of course a select few always end up standing out from the rest. My personal favorites were the Audi compromise with the big-headed dog (“The Doberhuahua”), the Doritos time machine and the Budweiser “puppy and Clydesdale” commercial. However, as an HR person, the commercial that really caught my attention was the GoDaddy “I’m quitting my job” ad. Who Doesn’t dream about leaving their job from time to time, and would love to do so in spectacular fashion? Everyone loves a good “take this job and shove it” fantasy. My initial reaction (and Facebook post) regarding the “Go Daddy” commercial was that she quit to go into the puppet industry?!? Is that a growing field? Was it smart to quit your job without notice in a Super Bowl commercial? My marketing friends talked about how genius it was, because she’s getting a ton of advertising and PR. Now, people want to know who she is and are looking up her and her business. But someday, if the full-time puppet show business doesn’t work out, she may need a new job, and, unfortunately, she’ll be remembered at the lady who stuck it to her boss in front of 98.9 million people. I happen to see a lot of people quit, and it always shocks me about people’s perception of quitting, so I’d like to give a little advice. Don’t burn a bridge- the world is so small and getting smaller every day as social media gets larger. The last thing you do before leaving a job is what people will remember. They’ll remember if you walked out and gave no notice, and you won’t have support from your former co-workers because they had to their job and yours. They’ll remember if you left things a mess because you checked out months ago while you looked for another job. They’ll remember the scene you caused if there was a big blowout or nasty email. The words “she was a great employee but went out in a blaze of glory” have never been spoken. On the flip side, however, your former employers will remember you favorably if you’ve left a list of action items to be completed for the next person in your position. They’ll remember if you leave instructions on how to do things. They‘ll remember if you give notice and thanked them for the opportunity. Remember, you couldn’t make the next move in your career without everything you learned from where you are now. So treat your exit with dignity and respect and most former employers will do the same. Someday even Gwen the puppet lady will need a reference, and after the novelty wears off, she’ll still be remembered for sticking it to her employer of 18 years. Make sure you know what people will think of you after the novelty of “I’m otta here”. wears off! If you are looking for a puppet show or want to hear about Gwen here’s her website. For fun here’s how the Dancing Girl’s boss reacted. What do you think about the “I Quit” ad? This entry was posted in Employees and tagged Bruno Mars, employees, Employment, human resources, Puppets by Gwen, quitting your job, resignation, Super Bowl, Super Bowl Productivity, Work. Bookmark the permalink. 1 Response to Quitting your Job, Puppets and the Super Bowl! Pingback: Are You Ready for Some Football, Hangovers and Sick Days? | don't bite the apple…work is not a fairy tale!